Visit our page with Snaidero offers! The kitchen needs to be functional, comfortable and timeless. A place where you can feel comfortable having a cup of coffee in the morning. Or doing homework in the afternoon with the kids, or preparing a formal dinner for friends. Or simply a special place to reflect on your day and plan for tomorrow. We believe that Snaidero reflects the kitchen of today. Snaidero is a major leading manufacturer of kitchens in Italy that takes pride in quality and design. The company’s motto is Cucine per la Vita. Kitchens for Life reflects the care given to producing components whose quality and style make them endure over time. Snaidero’s service includes a 10 year guarantee contract. This QSS (Quality Service Snaidero) contract is exceptional in the kitchen sector. Snaidero is able to offer this service thanks to more than 50 years of experience and its complete confidence not only in the quality of the materials used, but also in its ISO 9001 certified Quality System. From the delivery date onwards, the kitchen is covered against any inherent defects attributable to the manufacturing for 10 years. 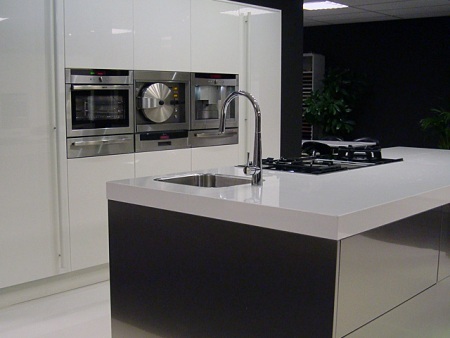 We design the kitchen together with you in our showroom. We provide expert advice to help you choose the right composition and appliances that meet the requirements of your lifestyle. To make our service complete we also give exclusive cookery lessons to our clients. Do not hesitate to contact us if you have any questions.